I don’t know about you, but I am not a fan of winter. I hate the snow, ice, and windchill warnings. I hate the rigamarole of squeezing my daughter into mitts, scarves, boots, and winter coats every time we leave the house. I hate everyone coughing and sneezing all over us everywhere we go. I hate winter weight gain. And most of all, I hate how dry and itchy and gross my skin feels this time of year. But after a particularly horrible and long winter last year, I refuse to allow myself to get into another depressive slump over the cold and miserable weather, so I’m doing some prep work to help make this my best winter yet. We got our flu shots, I bought myself a toasty new coat and the warmest boots known to mankind, I’m committed to working out 5+ days a week, and I’m printing off this list of 7 winter beauty tips for fabulous skin to keep me looking and feeling my best…even when it’s too cold to go outside! Ever since I moved back to Canada when I was 18, I have had problems with eczema, and I find it’s particularly problematic when the weather turns cold. For years, I (unsuccessfully) tried to deal with this with over-the-counter creams, but I eventually admitted defeat and sought the help of a dermatologist. I cannot remember the specifics of what the guy said to me, but I do recall getting a lecture about using hot water on my body as it strips the skin of its protective oils. And while I miss the relaxing feeling of taking a nice, hot shower or bath at the end of a long day, I have to admit my short, tepid showers have gone a long way in warding off dry, flaky, and itchy skin. We invested in a good humidifier shortly after our daughter was born, and I cannot say enough good things about it. It soothes my skin, helps with my husband’s winter nose bleeds, and reduces hair static. Who can complain about that? As soon as the cold weather hits, I start to get little cracks on my hands. They are the most annoying and painful things EVER, and they often take a really long time to heal, especially since I’m a SAHM who is constantly cooking and cleaning, you know? But after making a conscious effort to wear warm gloves whenever I left the house last winter, and also wearing rubber gloves while doing the dishes, I saw a noticeable decrease in the number of those horrible cracks. And on the nights when my hands were really raw and sore, I would slap a bunch of moisturizing cream on my hands before bed, and then sleep with a pair of cotton gloves over top. It really worked! I’ve tried TONS of different creams over the years, and all have their pros and cons, but my MIL recently bought me a tube of L’Occitane Shea Butter Hand Cream and I am IN LOVE with it. While not directly correlated with dry skin, I find sleep is really important in helping me get through the winter months. Not only does it give me more energy and make me more patient when dealing with The Trying Threes, but it also makes my skin look and feel healthier, boosts my immune system, and keeps my winter weight gain in check. I’m serious! I once read somewhere that the best time to moisturize your skin is immediately after taking a shower, so I have made this part of my morning routine, and I try to remember to apply another coat of cream to my problem areas (arms, legs, elbows, and heels) before bed. I don’t use anything fancy – just whatever is on sale at our local drugstore – but I try to avoid moisturizers with a ton of perfume in them as I find they irritate my skin even more. I have never tried using oils on my skin, but a friend of mine slathers herself with baby oil in the shower every morning (don’t worry – she rinses it off) and swears it does wonders in combatting dry, itchy, flakey skin. So if you’re really suffering, you may want to give her trick a try! I always used to think exfoliating dry skin would be irritating, but over the years I have learned that it’s possible to get rid of dead skin without scrubbing, and that it’s important to exfoliate to allow moisture into your skin. For my body, I just use a loofah with my favorite body wash, but if you’re looking for something a little fancier, I’ve heard great things about Tree Hut Shea Sugar Scrub. My face is a different story. I’m not a fan of exfoliating scrubs as I’m prone to breakouts, so I stick with my Conair True Glow Sonic Advantage Facial Cleansing Brush. It’s perfect for getting rid of dead skin cells and unclogging my pores, and it has 3 different speeds so I can adjust it based on how sensitive my skin is feeling. 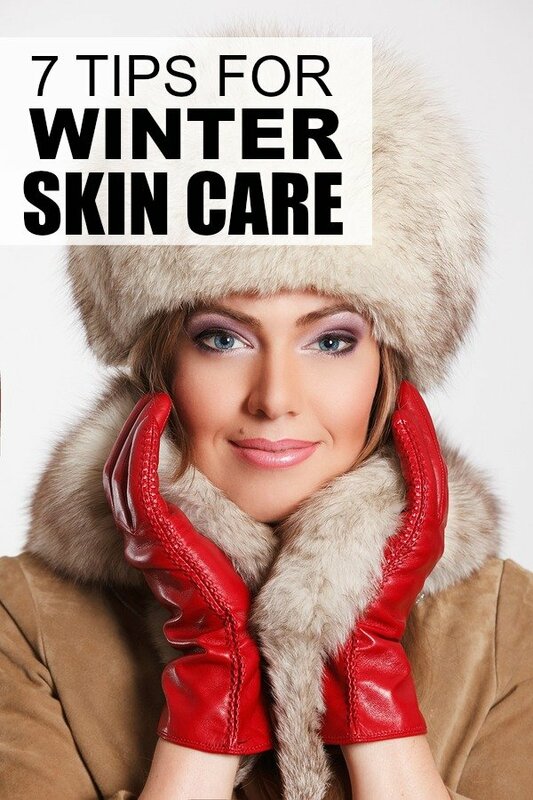 If you have any winter skin care tips, I’d love to hear them – just leave a comment below! And if you’re looking for more beauty tips, you’ll love my Chance of Makeup and Manis board on Pinterest! It’s filled with my favorite beauty products, hacks, and tutorials, and it has heaps of fantastic makeup tips and tricks, too! You can check it out below!